I don’t normally do a birthday party. Not for me, anyway. Kids yes- self no. This year, however, my husband was leaving me to go to Aspen for a bachelor party over my birthday. I am the coolest wife ever, btw. 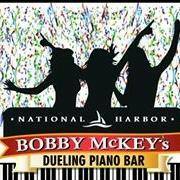 So, we decided that he’d cover me and some friends going out for the evening, and I wanted to take them up to check out Bobby McKey’s Dueling Piano Bar in National Harbor. If you’ve never been to a dueling piano bar, the are so much fun. The way it works is pretty simple. There are some standing room and first-come seats, but if you’re taking a larger party or want guaranteed seating, you can order tickets online . Prices vary based on night of the week and where you want to sit, and you have the option to add appetizers and drinks ahead of time (or you can order off the menu while you’re there). I ordered our tickets in advance, and since it’s a little bit of a drive (about an hour) to National Harbor, we had a few carpools of people go up. 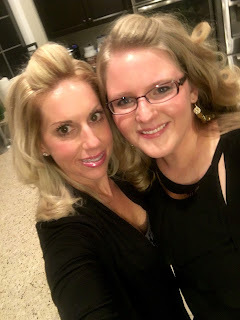 One of my sweet friends came over and did my makeup for me and then we headed out together. Once you arrive, you check in and are shown to your table. Heads up- there are glow necklaces 🙂 At the front you’ll see a stage with two pianos, a keyboard, and some drums. There’s a singer at either piano and they are TALENTED. You’ll want to bring some cash with you because the napkins double as request slips, and you can write down the song you’d like to hear on a napkin and include a tip to get it played faster (or at all depending on what you’re asking for). There are a bunch of songs that are amazing that get requested (a little Journey, anyone?) but someone requested the “Full House” theme song, and for $20, they got what they wanted. You should know that the bar is LOUD (obviously- there’s someone singing) so it’s not somewhere to go to chat. When we really wanted to let each other know something we ended up texting 🙂 However, most of the time we were too busy singing along (or acting shocked at someone not knowing the words) to chat. My group arrived at 8, although we had a little parking trouble because there was a huge convention at the Gaylord, we were all in our seats by 8:30. We had 3 people drive themselves and then 3 carpools, but most of us stayed until about 12:20. The service can be a little crazy- but it’s aided by light up stands on your table that alert your waiter/waitress that you would like something. We did a bunch of drinks and appetizers- they have typical bar food like wings and mozzarella sticks, as well as some surprises like a hummus platter. The musicians are amazing, but one thing they will do if you call and pay a few weeks in advance is custom songs. These songs can range in “OMG” factor from “oh, that would make me blush” to “DID HE REALLY JUST SAY THAT??”. If you are easily offended, you should know that there’s also some PG-13 joking that happens. There are 2 mirrors (one behind each piano) and you can outbid the previous phrase to have yours added. My husband ended up calling in from Aspen to leave me a note, which was super cute. You could actually hear my table “Awwwww” over the piano music, which is pretty impressive, although there were 14 of us. In addition to adults-only nights (where it’s ages 21 plus because it is a bar, after all) Bobby McKeys also hosts family days and teen nights, which I think would be so much fun. The next family show is actually this weekend, February 27th from 1-3:30pm. Tickets are $18, but they include the show and a buffet. They also have birthday party packages if you’re interested! That’s followed with the Teen Beats show from 4-6pm. I had such a fun time for my birthday at Bobby McKey’s. One of the ladies in my group thought her church staff would have the BEST time doing a team building there. (I have got to check out her church). I actually already have plans to go back with some other friends for a double date night. I really enjoy singing along to the music and enjoying the concert-like vibe. Be sure to check it out for your next event, girls night, or just your next date night! Disclosure: Thanks so much to Bobby McKey’s for providing some of the tickets for my birthday. And squeezing in one more person when I didn’t count right and needed to buy more. Our trip wasn’t free, though, and all opinions are my own.